After a well-deserved break from the arduous process of getting used to the sight-size method (and a very busy week), I’m back at it. Plate 1.5 went fairly well, especially considering it’s been over two weeks since I did my last Bargue drawing. This one was completed in about 1.5 – 2 hours. While being conscious of the fact that I should take breaks frequently to give my eyes a rest, I have to admit that I refrained from doing so because of constraints on my schedule this week. Regardless of my lack of discipline, the only problem that I saw when I laid a tracing of the original over my drawing was that it was ever-so-slightly wider than the original. The placement of the different parts, however, in relation to the whole was very close. I did make a point to check the drawing many times in reverse by looking in a hand-held mirror – and old art-school trick that has always been helpful! Finally – a drawing that ended up somewhere between close and really close! Tonight I learned some interesting lessons as I worked on plate 1.6. I have to begin, however, by saying that I’m extremely pleased at how well it turned out. 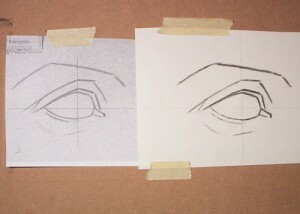 When I laid a tracing of the original over my drawing, I found that all of the elements were in the right place – the only imperfections being a line or two slightly off. It’s much easier dealing with this drudgery on a regular basis when you start to see some improvement! One lesson learned was the importance of line-weight. I’ve thought about this while working on the other plates, but with this drawing it seemed like it made all the difference. Tonight I would have been lost without my trusty kneaded eraser to shape and re-shape the clumsy charcoal lines that I was laying down. The more plates I do, the more I respect the skill of the hands that created the original drawings. The lines appear to have been laid down so effortlessly and in exactly the right place the very first time. This is why I’m doing the Bargue Drawing Course – to develop the confident hand of a master draftsman… And while it is tempting to use pencil to do the drawings, I have to stand by my belief that using the vine charcoal as intended will bring about a better results. Why, you ask? Call me a masochist, but I think using the vine charcoal forces you to think more before you place your lines. It lays down a thicker, darker line than a pencil and requires more control. Overall, I believe that doing the course this way not only trains your eye and mind, but also develops a steadier and more sensitive hand. Right now I have to resort to using the eraser to fix my mistakes, but I’m hoping that, over time, correct line thickness will become second-nature to me. The other major lesson that I learned was to not always trust my eye. That seems slightly backwards considering that I’m trying to develop my artistic “eye” better. The reason I say this is that throughout the drawing, I kept getting the impression that it was much too wide, or tall, or crooked, or whatever… Something seemed off, but I just couldn’t put my finger on it. This led me to repeatedly re-measure my line placement with the plumb line, check my angles with a wooden skewer (a very useful little tool), and look at the drawing in a mirror. Even after all of this checking and double-checking I was still not convinced that the tracing overlay was going to be anywhere near close. Also, this drawing took me 1.5 hours – fast for a Bargue drawing – which didn’t make me feel any better about it. I even forced myself to sit down for a while with my eyes closed (to give them a rest). 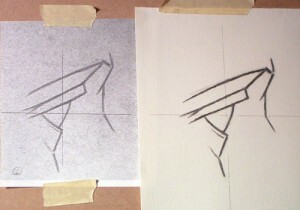 Alas, in the end all of my measuring paid off, and I ended up with the most successful drawing yet!